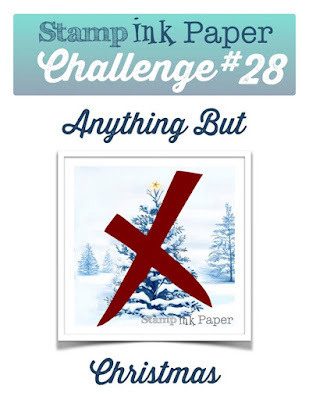 Welcome to our challenge this week at Stamp Ink Paper and Happy Tuesday :-) Here are the details of our challenge, which is pretty self explanatory. I decided to take this opportunity to show you a card I've made for my Father. His Birthday is New Year's Day and I've made a flip style card using the Label thinlit card die combined with Guy Greetings and paper from the Winter Wonderland specialty pack. This style of card is a little more difficult to photograph, so please bare with me as I've taken several shots to show all sides. The cardstock I've used is Crumb Cake for the base, Basic Black and Whisper White with Memento Black ink used for stamping the images. The white panel on the reverse allows plenty of room to write a personal message. Thanks so much for stopping by today. 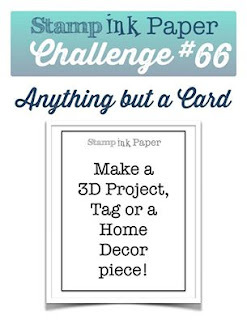 I can't wait to see what you create for this week's challenge and please make sure you check out our other Designers amazing work this week at Stamp Ink Paper. I love your flip card Carolyn...an awesome male card! Wonderful card Carolyn! Terrifically masculine and masterful combination of DSP. Thank you very much, I thought the style worked well with those stamps and paper.